"More than two centuries ago, we fought a military revolution over the sacred principles of individual liberty and limited government. Siunce then, millions of brave men and women haev sacrificed their very lives to defend them. Sadly, these principles are now under assault by radicals in our own country. 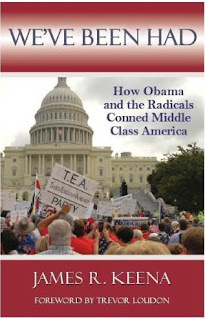 The TEA Party movement is nurturing a grass roots political uprising to retake America from the radicals in Washington." "I was not eager to read We've Been Had. That was simply because I had grown very weary of its subject matter, one Barack Obama. I am so glad that I overcame my initial resistance and read this excellent book... It is comprehensively researched, masterfully organized, fluently written, and pleasantly free of shrillness. I had feared a rant, but on the whole, the book is written in a comfortable, almost conversational tone... We've Been Had is an amazingly breezy read for an encyclopedic study (76 pages of endnotes in support of about 270 pages of text) of the President of the United States and the various influences that have shaped his character and values." I can't recommend the book enough myself. I was privileged to be invited by James to write a foreward for the book. People will only become engaged when they understand the consequences, when they know full well what's at stake. The second American Revolutino will succeed or fail by similar means. If enough information can get into enough hands, quicly enough, America will have a fighting chance. Jim Keena's book is a valuable contribution to that cause. "Siunce then, millions of brave men and women haev ..."
Hey, I was never had....I knew what he was about, all you have to do is listen to him. I think most of us knew ahead of time who he was, but not the full extent of it. I used to think if we knew what the president knew, we would never sleep at night. Now, I think if we knew what the president is doing, we would never sleep again.